This is the result on an attempt to create a game in 5 hours. Trying that was ambitious so the time doubled to 10 hours! (including a couple of breaks.) The person working on the art and sound managed to get everything done much quicker. A video showing the creation of the game will be uploaded to YouTube soon. 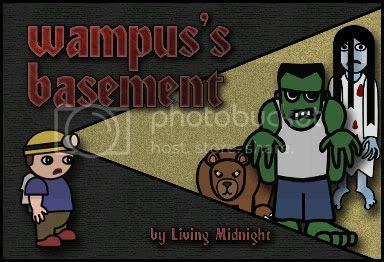 Instructions: Use arrow keys or a joypad to control Wampus as he searches for a way out of his haunted basement. Collect a key before going to the way out (an upward pointing arrow). Be careful of monsters! Contact with them will wear you down and kill you. They're smart too so don't underestimate them. Creepy Ghost Girl - She is slow and doesn't do too much harm. Beware of her catching you in a dead end. Manic Frankenstein - Strong and persistent, he'll hunt you forever until he catches you. Big Brown Bear - The bear is a formidable opponent. He'll tear you to pieces in seconds if you can't escape him. Mystery Monster - This dangerous creature may be the last thing you'll ever hear or see. Developer notes: This was very rewarding and fun to do. It was also stressful because of the pressure. I found that GLBasic shows some of its greatest strengths when it comes to getting something created quickly. I did cheat a bit, i.e. 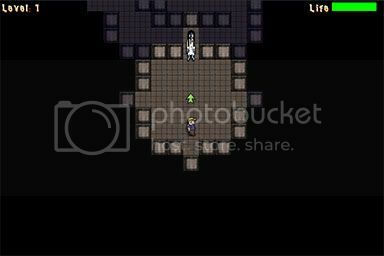 wanting to limit the vision of the player character to what could be seen from his perspective I imported some line of sight code I created previously. Since the code is unlikely to get used ever again I thought I should use it for this at least. A lot of time was spent on bug fixing because I made some dumb mistakes by not thinking about what I was doing before I tried to code. Play testing also took up a lot of time at the end. Initially the game was way to hard and the mazes were too big. Its still a tough game though. Because this worked out I want to try to create a small-ish game in a week when the opportunity arises. Nice game, and scary sounds! 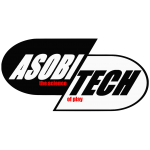 With the power of GLBasic, games can be done in 10 hours. I really recommend trying this sort of challenge if you haven't already. Its fun and helpful in all sorts of ways. Spot on Wampus! Impressed with the quality considering allowing yourself only 10 hours. Strictly speaking it took quite a bit longer in work hours, since there were two people working at the same time and I ended up including some previously written code. Also it helped that the game concept had been floating around in my head for a while so I knew how I might make the map system work. Sticking to Ludum Dare style rules would be much harder, but then the time limit is 48 hours for that. The video for this is now up on YouTube.